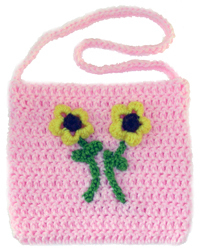 Brighten up a child’s day with this fun and flowery shoulder bag! It’s great for toting around some toys or playing dress up with. The shoulder bag is easy to crochet. You can even use scrap yarn for the flower appliqués. Just follow the crochet pattern below to make a great gift for a little girl. Gauge Swatch: 3’’w x 2’’h (7.5cm x 5cm) ch 12. With yarn needle, sew strap to bag. Using photo as a guide, sew flowers and stems onto bag with a yarn needle. If you need help with crocheting this bag, just leave a comment and I’ll be glad to help! This pattern was requested by a Crochet Spot Newsletter Subscriber! If you would like to receive the free newsletter too, just fill out the orange box at the top of this page. This entry was posted on Tuesday, April 14th, 2009 at 12:00 AM by Rachel Choi	and is filed under Free Crochet Patterns. You can follow any responses to this entry through the RSS 2.0 feed. You can leave a response, or trackback from your own site. This is adorable! Thank you!! I think I’m giving the one I made to my little cousin…maybe for xmas. This Is Adorable, I Love It ! I Can’t Wait to Make A Couple For My Grand Daughters Julie & Lydia. I’ve Been Making Baby Booties For My Grandbaby That’s On The Way. Do You Have a Pattern For Anything For A Baby ? What Can You Come Up With. I Love All Your Patterns Because Their So Easy To Do..
Thank’s For The Link.I’ll check Them Out. Does the ch-2 count as a DC? Nope. They only count as a dc if it’s noted in the pattern. Let me know if you have other questions! I saw your adorable hobo bag and continued looking! I think I’ll be making this one and the hobo for myself! Both are the perfect size with the best adorable looks!!! Thank you for sharing!